In our upcoming small works show Ports of Call, nature is at the forefront! Take a look at some of the seaside artwork coming into the gallery on May 17th! Small Works: Ports of Call focuses on marine-inspired art, which features paintings of boats, sails, docks, and ocean views. As seen below, artists including Del-Bourree Bach, Ann Marie O’Dowd, and Maureen Vezina will be showing their interpretations of boats on the sea. In Bach’s Quiet Sail, a single sailboat with a bright red sail sits peacefully on smooth water, while in O’Dowd’s slightly abstracted Lobster Boats in Magical Sea, the water dances in mesmerizing swirls around two motorboats. 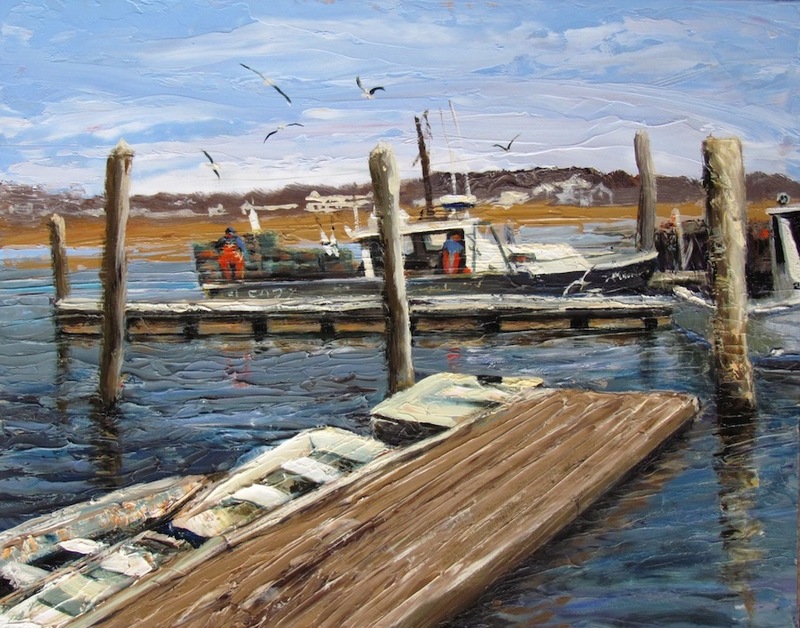 And Maureen Vezina’s rich oil painting captures the energy at a fishermen’s dock. Photography is also featured in Small Works: Ports of Call. The photographs by Roger Palframan, Joe Reardon, and Julian Cherubini take wide views of vast seas. While Reardon and Cherubini’s photographs are lush with sunset colors, Palframan’s piece is sleek in a monochromatic palette. See these natural scenes in our new small works show, Ports of Call, which opens in the Lower Gallery on May 17!